We've added the ability to download (almost) any Everybody Edits level you want! The new Download Button can be found next to the 'Like' and 'Fav' buttons for you to be able to download levels you wish to play offline! Now, this is in advance of us launching Everybody Edits Offline before EE shuts down, which Cercul1 is working on. As such, when we launch EEO, the intent is that you'll be able to just double-click these files to play them, and away you go! EE Offline is effectively a 'reduced' version of Everybody Edits. There will be no chat, no usernames, no name list, no shop, and no lobby. That being said, the levels we do plan on including in EE Offline are all the Campaign Levels (and their Time Trials), including seasonal ones, so you will be able to play all of those to your heart's content! One of the primary benefits of playing this version of the game is that you'll be able to play with any items and smileys currently in the game, all fully unlocked, and you can still build levels, edit any you load, and save them to your drive, if you wish to do so. These files aren't locked in any way, so you can share them with friends if you want them to play your creations! We plan to launch EE Offline in June. This update today marks what will most likely be the final 'content' update for Everybody Edits, in terms of adding any new items or functionality to the game. We still plan on releasing at least one more campaign soon, and the Campaign Team are working hard to make it a helluva final campaign to remember. - A new loadscreen designed by Kira! The Patrons have the most likely chance of becoming a moderator, and in the past Chris Lamb talked about how he was considering making becoming a moderator a benefit for large donor Patrons. I talked to him a few days ago before he blocked me, and he told me that the bribe that he'd accept for becoming a moderator would be $12,000 - and Brandon (who is a large donor) will likely reach that threshold. To clarify, $12,000 is the official bribe to become "staff", not necessarily a moderator, because that would guarantee we can attend Gamescom in Germany. That's the target amount needed. We would find the most suitable position for the individual on staff. Brandon is nowhere close to that, has no intention of reaching that, and has no interest in being staff (as far as I'm aware). Approximately 300 accounts have been affected. If you have lost friends, but it doesn't appear your account was affected in other ways, it's likely we would have already gotten to restoring your gems and username before you got online, 2B55B5G being just one example of that. We have not started restoring any friends yet. If you could abolish any one law from any one government in the world, what law would you abolish, and what government would it affect, and why? Whoops. Was going to go back to that one, but forgot. Edited. how much progress has cercul made on EE offline? He's currently working on allowing people to download levels from within EE, which should come in an update quite soon. ^ What the hell is this? I never asked this question. WTF? Also whoops. TaskManager asked, and now I've edited that too. We're not ruling it out, but they definitely won't be available during Closed Beta. You'll still be able to download current EE levels for use on EE Offline and listen to music made like that. Basically, music blocks in EE Universe would be one of the lowest priorities of all blocks, because the number of people actually using them is pretty low. There's been talk about having similar blocks to the drum pack for sound effects, but that's the closest equivalent. We still plan on including Music Zones with premade music composed by staff. Music zones with uploadable custom music when? custom MIDI music (MIDI to avoid abusive "bad" music) for EEU, can we have that? Probably never. There's nothing stopping people from submitting music they compose if they're interested in us adding it to the game officially though. For legal reasons, we simply cannot allow people to upload music without a submission/vetting process, due to copyright & licensing issues. MIDI really doesn't full circumvent that. We're currently in the Closed Alpha of EE Universe. We're projecting that Closed Beta will most likely be accessible during May, although the first invites may be sent out late April. Do you like doing your job? If you could do one thing differently with regards to your work as the owner of Everybody Edits, what would it be and why? Probably just trying to stay more professional than I sometimes have been. At times, I've been known to let my emotions cloud my judgement, but I've been trying to improve on that. I've learned a lot over the last 16 months of being the owner though, and I'm glad of that. Besides EEU, what are your goals in life, if you're comfortable sharing? I'd like to be able to pilot light aircraft eventually. Something about taking pilot lessons and being able to be in control of flight really appeals to me. Do you have dreams about Everybody Edits? If you do, what are they like, if you mind sharing? As MegaLamb a few years ago, I definitely had some dreams about Everybody Edits, but I don't really recall them at all, and I don't think I have them any more. Another tricky one to answer, although the first to come to mind was Lindsey Stirling. Favorite video game besides Everybody Edits? Well, I've definitely committed the most time in my life to RuneScape, although I haven't played that in a long time. It's hard not to say that Xenon is my favourite, as it's the game I loved more than any other as a kid, and the name that inspired this username. I was completely hooked by GameGlobe, and that game changed my life for the better, so I guess I'd say GameGlobe, even though it's no longer playable. Dark Chronicle (Dark Cloud 2) and Ni-No-Kuni are a couple of my favourite RPGs, although I really enjoy the entire Final Fantasy series, my favourites there being XIII-2 and IX. The games I currently mainly play on my mobile are Final Fantasy Mobius, Final Fantasy Record Keeper, King of Thieves, and Alien Shooter, which is quite a good spectrum of representation for the games I enjoy most. Favorite work of visual art? Depends what you classify as "visual art", but I'm going to guess you mean a static work rather than something in video form. If so, I generally like optical illusions when done well, and M.C. 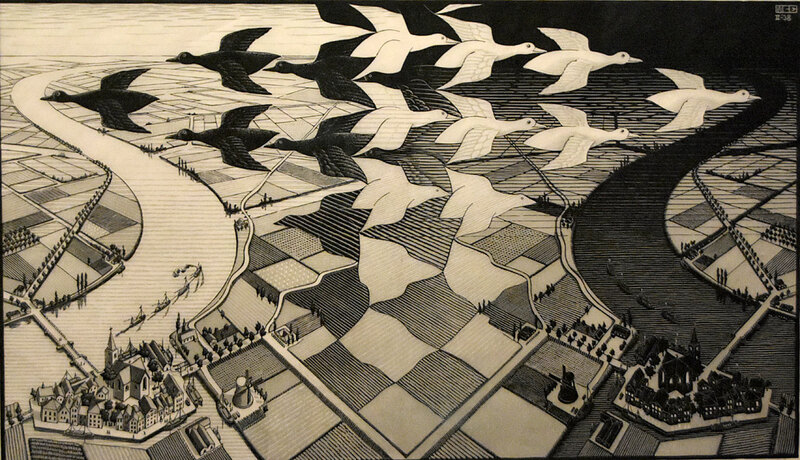 Escher is one of my favourite artists. Most people know him best for his "Relativity" work (the stairs one), although I like most of his other works too, including this one for example, called "Day and Night". I think the best works of art are the ones you can look at again and again, and keep spotting new features you didn't notice the first time you looked, and this piece is a good example of so much going on in a deceptively simple setting. What do you do in your free time nowadays? Well, sadly, having sold my piano a few years ago, I no longer play piano in my spare time. As my work mainly keeps me indoors, I'm trying to get outside more by doing Geocaching, and I've so far found 60 of them. Playing piano and composing music. I massively enjoyed going to Sweden when I was 18. Going to Gamescom in Germany in 2014 was also amazing, although I was sort of "working", so not sure that counts as a holiday. I really enjoy Center Parcs in the UK, and have been, mostly with my family, more than 10 times in my life. I guess any of the laws related to punishing people because of their sexuality. It's their choice how to live their lives, and it doesn't affect governments or politics at all, so it's ridiculous to arrest and/or execute anyone just because they aren't straight. Aren't bunnies just so cute? Kittens are cuter I feel. Do you enjoy creating these AMAs in order to feel important and for the impression that people are interested in you as a person? I generally create them with the intention of trying be more informative to the community, but if the community chooses to ask me questions unrelated to Everybody Edits, I'm still going to answer them. Did you know we/i recently gained control of /r/everybodyedits instead of /r/everybody_edits??? Can I get superman smiley? Why (not)? Nope, only because you're not staff. There'll most likely be a way to unlock or use it in EE Offline though. Hey Seth, can you stop with those Ask me anything topics? Only 4 in a year really doesn't seem like a lot to me. I don't think there are many 'meme' levels existing in EE that would fit such a campaign, so probably not. Will there be a final Easter egg before EEU releases? Well, it is Easter soon. Are there basic campaigns in the future? I'd say ask the Campaign Team, but I don't think so. Is Kirby a 47 years old bald man with yellow sunglasses ? Close enough. I have 'Reactions' glasses. Have you tried chicken and chips? Who makes the most drama on the forums, in your opinion? When will EE offline be released? Currently expected in June, although hoping to be able to allow downloading of worlds before then. Will you be able to add your custom blocks there? I guess we could add the custom block code from the Design Contest back, but there's not currently any plans to. Those with enough programming knowledge could probably just edit the sprite sheet and recompile the game with their own custom graphics anyway. Will you be able to add your custom hazards there? There are no plans for that currently, but if Cercul1 would be interested in setting timers for things like lava, sure. If you only mean visually, same answer as above. Will it be possible, e.g. with your own server to make EE multiplayer? I highly doubt it. Things like the lobby, chat, and usernames won't exist. Will EEU have a colorise option? That means that you select the HEX of the basic brick and it will be recoloured. No, although we have other ideas and plans for potential hex options. Will EEU have "lifes"? Hearts like in Minecraft. There are no plans for that currently, no. Will EEU have AI player? I find it relatively unlikely. What about an RPG/battle mode? Certainly not at launch, but I have some ideas for alternate "modes" much later in development. When will you release the JS library for bot writing? If you mean the API, I presume whenever the developers would be ready to do so. The best way I would recommend to see progress would be to subscribe to ByteArray's YouTube Channel, as he posts a new vlog every week, and recently, he's been posting a lot about EEU, including some gameplay!. EE Universe will have switches at some point, probably during Closed Beta, but might not be at the very start of Closed Beta. We'll see. Magic Coins will most likely work in a similar fashion to Everybody Edits in terms of how to get them, but when you get them, you'd receive an amount of Stardust which I'm hoping will sort of "burst" out of the coins. In addition, you'll most likely gain AP from them, but I'll let you speculate over what AP might be. Is there a secret (eg, any form of easter egg) in the game that, as far as you are aware, no one has discovered yet? Nothing in terms of being able to "gain" anything, but as far as I'm aware, no-one other than Kirby and myself know the reason the Nostalgia Campaign description is what it is. what will ve the first update in EEU i mean iwll you dump 200 blocks on release or not? Depends what you mean by "release". If you actually mean after the Open Beta stage, there most likely will be over 200 blocks by then, but in Closed Beta, I doubt we'll have that much close to that. Currently BST (British Summer Time, UTC+1), but usually in GMT (Greenwich Mean Time) or UTC (Universal Time Coordinated). EE Universe's servers are most likely to run on UTC, even though they're more likely to be based in the USA. Single, and none. My mum and one of my two brothers are coming to visit on Tuesday. On a scale of 1-10 how annoyed at the community were you during the recent drama? What a lovely way to round out this AMA with a big round 10! Thanks everyone for the questions, and see you in-game soon! Round 4 of Ask Me Anything! Standard protocol - 24 hours to ask me anything you like, and I will attempt to answer all of them in some form or another. Yeah, that's absolutely not impossible. Really wish you'd put that screenshot in a spoiler warning. Some people want to find these things on their own. Could any seasoned EE historians / friends of Xenonetix or Megalamb as he was known in the earlier times give me some detailed background of his activities, friends, community status etc from his first join date to today? If you could construct an approximate timeline that would be great. I'd be very surprised if you get an answer to this that isn't biased or exaggerated in either direction. Well, let's give it a shot. I'll try to be as unbiased as possible. On 1st August, 2009, MegaLamb joined Kongregate, mostly playing with friends from RuneScape & FunOrb. FunOrb had a very competitive leaderboard system with achievements, and Kongregate had a very similar system in place, so he would compete with a lot of his friends to beat their best scores and earn the badges Kongregate had to offer. At some point in 2010 (although I can't remember exactly when, but some point during summer), Everybody Edits was featured heavily on Kongregate as a new game. No one had accounts at that point, so ML played it for awhile, had some fun, but there were no badges, scores, or much in the way of competitive gameplay. There was no way to save worlds either, so very little reason to return to keep playing. As such, ML just continued playing other Kongregate games, and thought nothing of it for awhile. In Novermber 2010, someone mentioned they were playing Everybody Edits to Mega, and the Kongregate game was gaining more popularity. As such, and as he would always do for multiplayer games, ML sought out the main website for Everybody Edits, and registered an account on 28th November 2010. As a creative individual, Mega tried to create some levels of his own, but none were really very good, and so he introduced two of his good friends Ephrayam and Rayosun from FunOrb. 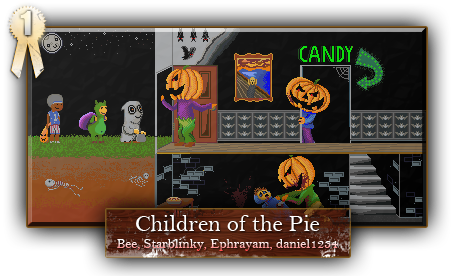 Ephrayam was one of the best players, and Bee was one of the best artists, so combining their skills, they entered the first competition Everybody Edits ever had, which was the New Year's Contest 2010-11. Rayosun made an alt account called "Bee", and MegaLamb made an alt account called "UltraLamb", so Team EMBUR was born. Creating Reversible New Year, it entered the Top 10, and was voted 3rd overall. This competition was when Mega (and Bee) first started getting noticed for their levels. The contest basically produced its first 'famous' people in Everybody Edits, except for those who were either in staff, or in EX Crew at the time. As far as I'm aware, up until Christmas 2010, EX Crew was primarily just made up of the founding members, MIHB, MFL, & Mustang, who occasionally enlisted the help of some other community members. I don't know whether "The Clock Strikes 12" was considered an EX Crew level at the time, but I think it just resulted in many of the team, Nou, Ravatroll, SuperLuigi, and Starblinky joining EX Crew after the level won. I could be wrong though. I'm pretty sure Nou became the 4th official member either way, so Nou may have already been in EX Crew prior to the contest. Over the course of the first few months in 2011, Mega started to get to know more of the community, and become friends with many of them. The most notable chat groups at the time for him were Coldstorm, which was mostly made up of EX Crew Members and some testers for EX Crew Levels, and "Sleep Is For The WEAK", which was a group Skype chat produced by Cyclone and Rurigok, but had some EX Crew members, such as Mustang and RavaTroll at the time. Aslai, Ephrayam, Zalgryth, and ThuggishPrune were also present. During 2011 I believe, Floddy's Digbot came along, along with Cyph1e's Quickrace & Snakebot, and EX Crew Shift. As such, Mega got really competitive in all of these bot-assisted levels, and tried to aim to be the best in all of them in some fashion. As such, he became the highest tier player in the original Digbot, and top 10 in all of the others. 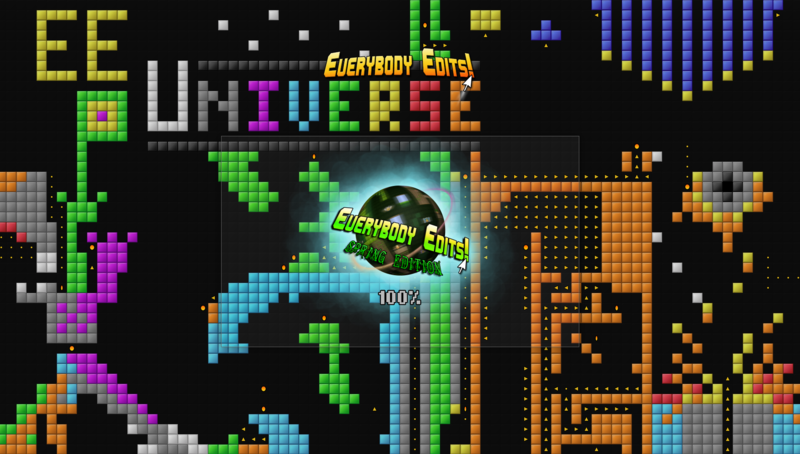 At some point during 2011, Mega also organized the Everybody Edits Worm, an attempted collaboration between 30 individuals of the community, which came out very well visually, but didn't work out so well in terms of cohesive gameplay. Nevertheless, he'd made more friends as a result. Shortly before Christmas 2011, music note blocks were introduced into EE, giving Mega a renewed passion for EE, as he'd done a university degree in 'Music, Commercial Composition, & Technology'. As such, he then spent most of his time in Everybody Edits creating music levels, with some assistance from friends. Soon after this, ML became somewhat obsessed with Shift, and producing levels for it. Eventually, he assisted Nou directly, helping with level creation for it, and eventually running it himself (at times when Nou was unavailable), becoming an official member of EX Crew at some point in early 2012. During 2012 though, things started to slow down. Mega would come on only to play Shift, and nothing else. 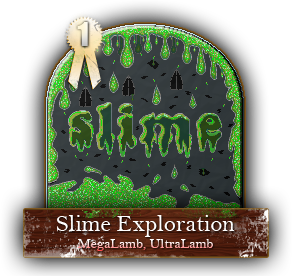 Even though Mega would still play from time-to-time, a new game called Gameglobe had just come out, which Mega found very appealing, as it seemed like pretty much a 3D version of EE, but with the leaderboard scoring he'd craved from Kongregate, FunOrb, and RuneScape, that Everybody Edits lacked at the time. He'd made it relatively quickly to Level 12 (Grandmaster) through the Magic system in EE, and had nothing else to aim for, other than scoring in Shift. Creatively, he would still come back to create a few new levels, such as the animation levels using some tricks he'd learned from running Shift, combined with EEditor, and if he really felt like creating music in-game, this was much easier to do in EE than GG. From 2013-2015, MegaLamb barely played Everybody Edits much at all. The game had stopped being updated (much), and Gameglobe had taken over as the game he would always go to. So MegaLamb was invited to become a moderator for Gameglobe, where the moderator accounts were always separate from the gameplay accounts. As such, he made the account Xenon, and then made his way up to being an Administrator, creating and organizing Leaderboard Challenges and building contests. This then led to getting a job as Global Team Leader for Bigpoint, followed by a Community Management Assistant for Square Enix Europe. He also got into streaming on Twitch for about a year from 2015-16, where many friends from EE joined to watch him play. During 2016, ML returned to EE more prominently, creating new levels, helping with the latest EX Crew Level, and playing hundreds of new levels that he'd missed that had been created while being away, also playing the Campaigns that had come in during 2015. Really, there's not much more to say. One of Nou's final acts as owner of Everybody Edits was to appoint Mega as a new moderator, and that's the end of the time MegaLamb was "simply a player". Actually the manager should be blamed for not having enough control over his own team. You are the one who is presenting the game. You should also take care for actions of your staff. And you also have to understand that not everyone will like you. Some will even dislike you. But still - you should take care of the entire game. Not the campaign team. I do. I also knew when making this update that the difficulties were incorrect. It was part of the April Fools' Update. Never lied (apart from potentially the difficulty listing, but blame the Campaign Team for that ), and never once claimed "everything is possible". That said, Tiers 1 to 4 were possible, as people did reach Tier 5. The Bunny Smiley was legitimately set as the prize for Tier 5, and if anyone successfully completed Tier 5, they would get that smiley. The part I naturally neglected to mention was that it was impossible to 'complete' Tier 5. Every other change was made with the intention that it wouldn't break anything, which is why I made sure to swap the textures of water and toxic waste, instead of making all current water kill people and all current toxic waste safe. So April Fools' Day has come and gone - Here's a list of everything that changed! Did you find them all? Every regular smiley was given a superman cape. Every gold membership smiley was given transparency and a static admin aura. All coins swapped colors and reversed their rotation, switching color after collection if you had god mode or edit. Poison turned to water, and water turned to poison! The Intestine Block from the Design Contest 1st place winners replaced the Death Gate after dying. If you had no campaign badge set, your badge showed the crying smiley. The Nostalgia 2 Campaign was added. All of the levels had inaccurate difficulties. New Year New Concept used to be an automatic level when it was released in 2011, but EE's physics have changed since, making it much harder. The prize for completing the whole campaign was the Bunny Smiley, but a shame that the final level was Floddy's Digbot (shown as Jump Jump Jump), and didn't include a trophy! Favourite, Unfavourite, and Magic sounds were all replaced with short sound clips from my old Geometry Dash streams. Last year's Easter Scavenger Hunt returned for one day for those that did not complete it. All Staff Auras were switched around. The background of the main site and the beta site were switched to an Everybody Edits Universe version of the Beta background. The loadscreen was made to fit to align with the background on Full HD screens (as can be seen in the spoiler). Collecting a blue coin had a chance to turn you into a Diamond Smiley that only you could see. We fixed this. Changing team suddenly had no effect, making Tutorial #3 impossible. We fixed this too. Welp, now I've really screwed up, having accidentally edited your post instead of creating a new one. Can't wait for the drama surrounding that. TheGame asked for the evidence on his forum topic. Great. We've reached an impasse then, because if he doesn't communicate with me directly, we're not going to get anywhere. As far as I can tell, the only reason to post such a thread is to produce drama, because he could have just asked me directly, and I'd have provided whatever information he'd like to hear in regards to the events. You are fully capable of providing an explanation to those who you punished, and that is absolutely the mature and responsible thing to do. And have communicated with those who I could get in contact with. I have answered every question they've asked me. It is tyrannical to punish someone and proceed to deny them the evidence demonstrating their involvement in a crime, as most judges do. You consider judges as tyrants? I think that probably says more about your view of the world than anything else, but anyway, I have not denied anyone involved the evidence. TheGame has not asked for any evidence, nor asked me any follow-up questions following the accusations. As far as I can tell, he has accepted his punishment, and is now just generally producing drama for further entertainment. I have denied the community the evidence. The community does not need to know the details of the investigation. I believe in evidence-based reasoning and I believe you purport to as well. Indeed. You know me well enough to believe I definitely do have evidence, and such an accusation on TheGame is not unfounded. I repeat on behalf of many others and ask why won't you provide him with the evidence. You are inadvertently inspiring more drama by denying him the evidence for his punishment than there would be from evidence demonstrating that he is at fault. You can repeat it as many times as you like. The reason is because he has not asked for the evidence, and that is it. It is no one else's place in the community, not even yours, to ask on his behalf. You may believe this is somehow inspiring more drama, but I believe the dramatic fallback from revealing a list of everyone who was involved, and the full evidence behind how they were involved, would create drama of epic proportions, providing far more damage to the game in the long-run, if such drama were ever to end. If you have overwhelming evidence, then why do you feel the need to hide it? Haven't hidden it from anyone involved. TheGame can make the claim that I'm hiding it from him all he likes, but absolutely nothing in my conversation with him led me to believe he wasn't rightly accused, and he acted as if he knew it all already anyway. My belief is that he hasn't asked for evidence because he's fully aware of his involvement, and the evidence would simply be providing information he already knows. Again, I feel the need to hide it from the community, because the community does not need to know. EDIT: I think I silently edited a spelling mistake, but whatever. You should provide an explanation to TheGame, he deserves to know the details surrounding his punishment, and if he feels like it should be public information he deserves to have EVERY right to share it with whomever he pleases. If he wishes to discuss it with me further, he is free to do so. He has me on Discord, and never denied or disputed any of the accusations made. Quite frankly, it's none of anyone else's business, and it's certainly not yours. TheGame decided to tell you our conversation, and that was his decision to make. You decided to share the conversation you had with TheGame in the unofficial Discord, and yet I don't see any evidence that TheGame allowed you to make the conversation you had with him public either. Once again, you have taken the matter into your own hands, when it is literally of no business to you, and appears only to be for light entertainment for you. It is a private matter, and I was fully ready to answer any further questions TheGame had for me in that conversation, but as you've seen for yourself, the only questions he asked were "would you like to call me bob or elonmusk69", and "How is EEU". I have never blocked him, and he is completely free to ask me further questions if he has them, but I do not believe it is anyone else's business in the community at all to demand explanations from me, because they would get us nowhere to do so. You are really making yourself seem like a know-it-all that can't ever be wrong about any of the actions you take. Do you really want to go down this route of being a tyrant? Never asserted to being wrong or right. The evidence we currently have points to the people involved being responsible, so we have taken the appropriate action on the people responsible. It's not tyrannical to investigate a serious situation, and then act on it. So quickly we forget that, thoughout all of this, I never once believed you (Atilla) had anything to do with it, and yet the number of people claiming it was so obviously you, and that I should be confronting you, was overwhelming, including the person you appear to be trying to defend so vehemently, who instantly tried to pass the blame on to you. We investigated properly, and came to the conclusion you were not involved. If we had just listened to the community, we would have had to take action on you far sooner, and as a result of the investigations, we have taken no action on you at all. Are those truly the actions of a tyrant? I doubt it in his case. Whether he was involved or not, he would just choose to share the evidence to generate further drama, and continue to deny his involvement. Not really. Providing our accusations are true, the people involved are directly responsible for the deletion of over 180 accounts. It's only because LukeM happened to have backups from a couple of days prior that we were able to restore them, and that still took us many hours/days to do. As such, I felt it only fair that the punishment for deleting 180 accounts should be to delete their own main accounts. If the owner has no evidence, then I should deserve the same treatment that he gives the rest of the community correct? Correct. Good thing I have the evidence. I do indeed have no intent on sharing the evidence, primarily because it benefits no one for us to share the details of our investigations, and would just cause more drama and controversy. The caveat given in his one question is "If the owner has no evidence,". By the very fact that the owner has some evidence, the rest of his point becomes moot. I never announced thegame's involvement in the whole situation. More than one individual was involved, and I have spoken to some of the other people involved as well, none of whom have come forward or spread further drama. In the Patreon Discord, I posted last Thursday following the question of who was behind the attacks: "I know who leaked the information - I do not believe it benefits anyone to reveal that information". If he wishes to discuss it with me further, he is free to do so. He has me on Discord, and never denied or disputed any of the accusations made. As far as I am concerned, the overall case is closed. So xeno when are you going to talk about thegame? He deserves an answer. He does? He hasn't asked me. Would love to know your response. I look forward to hearing it. Do you know how many people will die as a result of this data breach? Do you even care? Relatively certain 0 as a direct result. Pretty certain 0 as an indirect result.